Sharing the burden of presenting transgressive film with Other Cinema, YBCA has stepped up to the plate with their Stoned Apocalypse a pageant of sober mostly secular psychedelia. The other night I saw the world premiere of Nic SHEEHAN’s FLicKeR (not to be confused with the photo website or Tony Conrad’s The Flicker) a bemused doc of Brion Gysin and his invention The Dream Machine. With a rogue’s gallery of the usual unusual suspects (Burroughs, Iggy Pop, Genesis P-Orridge, a randy Marianne Faithful and Gysin himself). It serves up lots of above average talking head interviews but with a cast like this you’d watch their elbows talk. The upcoming month of Thursdays will include Brakhage’s seminal macho Dog Star Man that David Hicky has described as a Proto-pyrotechnic “Die Hard” cluster-feel with no dialog, no story and best of all, no Bruce Willis. Also the self explanatory “Legend Light Shows” and two maxi/minimalist narratives respectively, Ghost In The Shell II: Innocence and Le Lit De La Verge (The Virgin’s Bed). Check out http://www.ybca.org/film/ for time/dates and thank you for not smoking. I just found this out. Nan Hoover, a blindingly brilliant artist, fiercely dedicated teacher and vigilant supporter of young artists died in Berlin on June 9th. She was 77. The last time I saw her was in Düsseldorf where she let me stay in her wacky circular studio. Her contributions and influence, her footprint as it were, on that city’s Düsseldorf Kunstakademie was palatable and she was worshiped by her students. “Dear Nan, you were one of the most important international pioneers of video and performance art. You came to Amsterdam for a vacation, fell in love with the city and decided to stay. With your video art you revealed the beauty of light, stillness and time. Tonight! 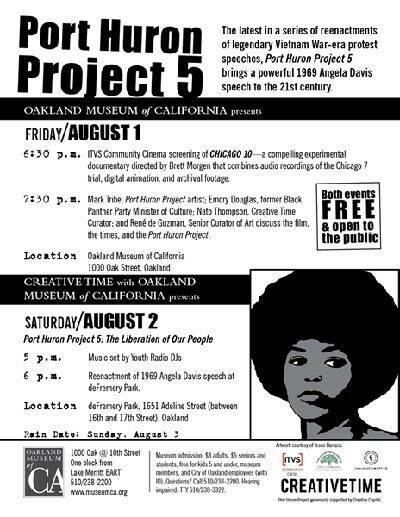 Don’t miss this reenactment of a 1969 speech by Angela Davis, part of a series of restaging of historically significant speeches by Mark Tribe’s Port Huron Project.